For Ash Wednesday and the Sundays of Lent, Bondings 2.0 is presenting spiritual reflections from a diverse group of students at the Graduate Theological Union in Berkeley, California, who either identify as LGBTQ+ or who are involved with LGBTQ+ theological research and/or ministry. Today’s post is from Elaina Jo Polovick, a second year Masters of Divinity student at the Jesuit School of Theology. Elaina is currently working on her field education at the Ignatian Spiritual Life Center in San Francisco. Today’s readings are Exodus 20: 1-17; Psalm 19: 8-11; 1 Corinthians 1: 22-25; John 2: 13-25. You can find the readings by clicking here. This image from today’s gospel is not the way I like to imagine Jesus. I prefer the image of Jesus as the Good Shepherd or Jesus walking on water. I’d even take Christ crucified over Jesus holding a whip. Yet, this story of the temple cleansing is found in all four gospels. There is something important about this story, and I think it is not about what Jesus is doing but why. Jesus displays a righteous anger at materialistic practices that were distracting people from what it really means to pray. Visiting the temple near the time of Passover, he literally turns the tables on a community who have supposedly come to worship. Jesus teaches a new way: the way of love and justice. But then I realize that Jesus’ zeal is about more than what is wrong with the way we worship. It is about orienting ourselves toward love for God. The gospel writer tells us that Jesus’ actions remind the disciples of Psalm 69 which says, “zeal for your house will consume me.” The psalm is a prayer for deliverance that implores a God of abundant and steadfast love to rescue God’s people. In today’s Gospel the people of God are nourished by a prophetic message of love. Jesus tells the people–rich and poor, disciples and Pharisees, those with power and the lowly–that love for God is enough. Love is enough, and to prove it Jesus foreshadows his own death: an act of love that requires no temple sacrifice. There is no need for cows or doves or currency exchange in the temple, because God welcomes us all regardless of our status. Jesus wants us to worship not with wealth and material sacrifice, but rather he wants us to be rich in spirit and willing to sacrifice ourselves. Lent is a time when we are called to sacrifice: to fast, give alms, and renew our faith. This gospel challenges us to consider what sacrifice has to do with justice and love. Do we love those on the margins enough to turn over the tables we see in our communities? Do we love our Church enough to run out those who distract us from the unrestricted love of our God? In today’s first reading we hear the Ten Commandments. We hear God telling God’s people what not to do. Although God comes up with a pretty good list of things we should avoid, the greater message is about what we should be spending our time doing: loving our God and our sisters and brothers. It is not always easy to remember that the Ten Commandments and the Cleansing of the Temple are about love. 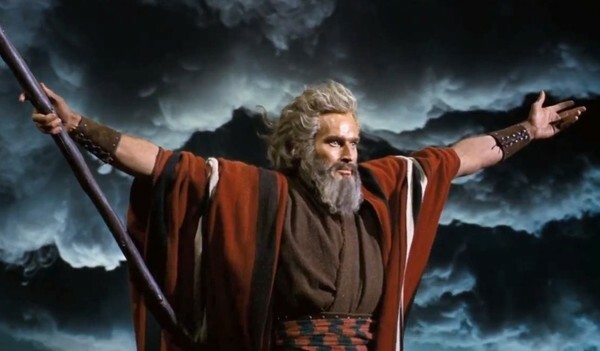 It is not easy to get rid of the image of the Ten Commandments seen from the famous movie where a strong, bearded Charlton Heston as Moses stands in the midst of thunder and fire on a mountain where God gives him glowing tablets. What if instead we remembered that after God loved God’s people so much that God liberated the Israelites from Egypt, and even when the Israelites got lazy and wondered if another God might be better God showed them love by sending them a list for them of basic rules to help them grow in love for God and one another. How are we going to cleanse the temples this Lent? Will we allow ourselves to be vulnerable or prophetic? I invite us to challenge our Church with righteous anger and passion to love more deeply. To proclaim that this temple is a space for prayer where LGBTQ and all persons are welcome to worship without cost. Let us turn over the tables of hard hearts. Let us drive out the parts of our Church that exclude others. Let our zeal for God’s love fill our hearts. Welcome, Elaina! Your smiling face and eloquent words create an oasis of beauty amidst this den of elderly trolls — wherein I must include myself — who tend to bogart this “Bondings” media space. I did my academic work at Holy Cross and Yale, so we also happen to have a Jesuit link in common. Please keep writing for our community in such a radiant and inspiring manner. We need all the spiritual help and inspiration we can get!